When Denver looks to peer cities that are doing transportation well, we look at Seattle. Turns out, the Baltimore region looks to us. 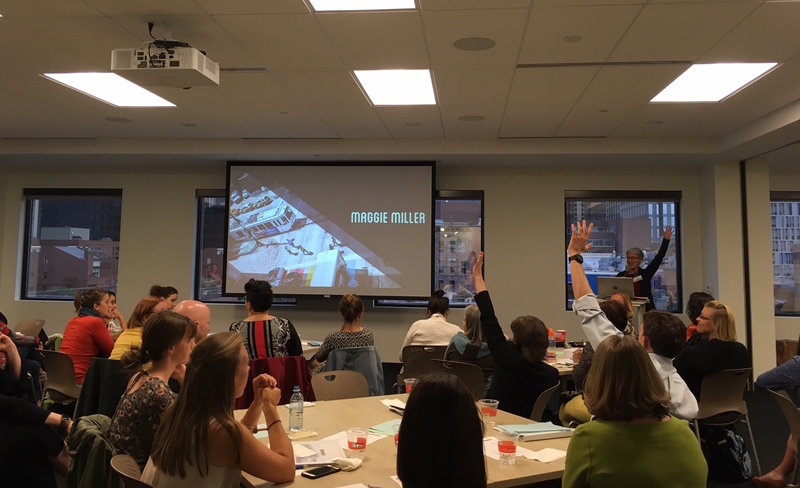 And advocates there recently looked to Transit Alliance, a longtime staple of Denver’s transit advocacy scene, to help them create an academy where people learn how to move the needle on sustainable transportation through civic engagement. Transit Alliance created the Citizens’ Academy 10 years ago. Executive Director Kathleen Osher just helped the Central Maryland Transportation Alliance launch a similar program — the seven-week Transportation 101 Leadership Academy — which just finished its first season. Back in Denver, the Citizens’ Academy has made marks on the city — several marks, actually. Gosia Kung, founder and executive director of WalkDenver, credits the academy with inspiring her to create the pedestrian advocacy group. Ian Harwick, co-founder of YIMBY Denver, is another graduate. Kung and Harwick are just two grads of nearly 900 over the years — including six former and current RTD board members, a state senator, three state representatives, and four of the six citizen co-chairs of the Denveright planning initiative. Baltimore’s transportation problems are stark. Buses and trains funnel people downtown, but that’s not where most jobs are for people without college degrees, says CMTA President Brian O’Malley. The city’s one subway line doesn’t really connect to the light rail, and the bus system doesn’t serve the one-third of car-free and transit-dependent people well enough. Baltimore hasn’t done a comprehensive update to its transit plan — like Denver is attempting — to match its residents needs. In 2013 Maryland passed a gas tax increase. As a part of that bill, Maryland matched the gas tax and transit fares to the consumer price index to help revenues keep pace with inflation. O’Malley believed that funding would solve a lot of problems. But Maryland Governor Larry Hogan cancelled transit projects — including the Red Line — and diverted funds to rural highways and roads. The controversy didn’t spark the creation of Transportation 101, but it helped O’Malley and Eric Norton shape it. Some of Baltimore’s problems mirror Denver’s, and some don’t. Transportation 101’s first class featured a University of Baltimore history professor who laid out how the city got to where it is. The Citizen Academy’s first class this session? Denver’s demographer, who set the scene with stats on Denver’s booming growth, and how it will continue to affect transportation. Regardless of context, the Citizens’ Academy model of educating residents is seamless, says Osher. Both academies require grads to form an action plan. Whether it’s starting an advocacy organization a la Kung, or creating a hub of information to promote civic engagement in advocates and transparency from the local government. Danielle Ongart, a recent Citizens’ Academy grad, plans to do the latter. West of the Mississippi Denver has three transportation peer cities: Minneapolis(St. Paul), Phoenix and Seattle. While Seattle and Phoenix are very different places from each other and from Denver, what they have in common is execution capacity. I’ve previously mentioned Seattle’s ST3 which will provide between $27 billion from taxes and $54 billion if fully leveraged. What Phoenix has is a metro area tax that funds $22 billion over 20 years (30% for transit) while the City of Phoenix now has $17 billion in tax revenue hoping to leverage up to about $31 billion. It’s how Phoenix/metro has built a First-in-Class freeway system and a (now) 26.5 miles of (mostly) urban light rail and intend to triple their light rail system. A new Streetcar with no overhead wires along Mill Ave will break ground this month and they’re on track to start a new light rail line in 2019.